Do you ever find that you eat more than you planned? Do you eat until you feel stuffed? Do you try diet after diet only to ultimately gain weight back? This might begin to make you think that there is something wrong with you and that you are doomed to struggle with food and your weight forever. I want to help you see that this is not a moral issue, and you are not lacking willpower or the ability to change the way you deal with food. What you could be missing is the key to changing your relationship with food. 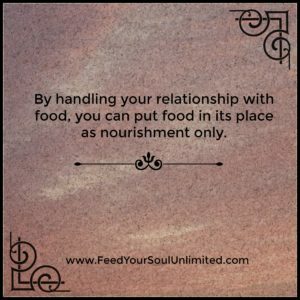 By handling your relationship with food, you can put food in its place as nourishment only. The key can be recognizing how your emotions are playing a part in your overeating. The emotional component is not helped by dieting or limiting food. Actually the opposite happens: you could ultimately eat even more by trying to limit food when you are eating for emotional reasons. Doesn’t everyone eat for emotional reasons? Yes, at some point everyone does. The question is – does it bother you? Eating to manage emotions is a challenge for many people because it can lead to weight issues that cause many other problems. Food can become a way to nurture yourself, when its actual purpose is to nourish your body. If we look to food to satisfy our feelings this may result in an endless cycle of diet/restrict-binge-guilt. 1. Eat large amounts when you are not hungry? 2. Eat so much you feel uncomfortably full? 3. Eat in isolation to avoid feeling embarrassed? 4. Eat and feel guilty, upset, or depressed afterward? 5. Eat more rapidly than others? 6. Eat to make you feel better? Does the way that you eat cause you problems? Emotional eating can keep you stuck because it has a component that actually makes you feel good. However, the positive feelings (relief, calm) are only temporary (one minute to many hours) and there is a turning point where it becomes negative and you might find yourself feeling angry and guilty that you overate (again). • Notice when you are eating for emotional reasons: for reasons other than hunger. • Acknowledge it to yourself. You cannot change anything until you recognize it and acknowledge it. • Give yourself praise that you are now “getting it” and willing to do something different. • Begin to identify the emotions that are leading you to eat: sad, mad, anxious, bored, or lonely. • After you notice the emotions then you can address them. You can develop a “toolbox” which you can draw upon. I have many items in my toolbox to help me take care of my emotions such as; journaling, taking a walk, talking to a friend, meditating, or working out. • Develop more mindfulness in relationship to your emotions by doing a physical check in. Try taking a deep breath and feel the connection to your body, then ask yourself how you are feeling, and what you really need. I find this mindfulness keeps me in touch with my feelings and a positive way to address them. Be careful not to go down the path of self-loathing for overeating “for so long.” I promise you this negative thought process will only foster a return to overeating for being mad at yourself for it. Now is the time for self-compassion. Realize that you have done the best you can, and now is the time to change. Seek out help through books, professionals, coaches, 12 step groups, and friends; anything to begin changing this pattern. I’m confident that you can make it happen! Kim McLaughlin, MA is a Counselor and Motivational Coach who specializes in working with people who suffer from binge eating and emotional eating. She is a Certified Intuitive Eating Counselor. She is the author of the Amazon #1 Best Selling book Discover Your Inspiration.